The United States got back on track and opened group play with a 2-0 win over Canada. The USA got to work immediately controlling the game versus Canada and pinning their northern neighbors in their own end. Credit Bob Bradley for employing simple, attacking tactics that were absent in recent matches for the Americans. Jozy Altidore opened the scoring in the 15th minute with an electric turn and fired a rip on net that proved too much for Canadian goalkeeper Lars Hirschfeld. Landon Donovan showed he is indeed healthy as it was his pass that found Altidore early on. It was all USA for the better part of the game after that. The boys in white controlled the ball and forced the Canadians back in their own end allowing almost no chances. It was New York Red Bulls midfielder Dwayne De Rosario who gave Canada their first real effort inn attack as he put a ball just wide with a shot from distance. Michael Bradley and his Canadian counterpart RSL midfielder Will Johnson traded cards later in the game. That was an interesting battle on the night as two very similar box to box midfielders were fast and strong, forcing one another to work. Dempsey was active on the night. 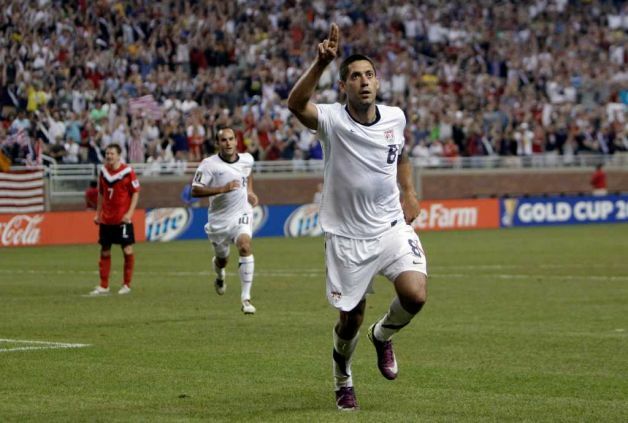 Clint Dempsey gave the American’s an insurance goal in the 62nd minute with a stellar finish after receiving a pass from Jozy Altidore. 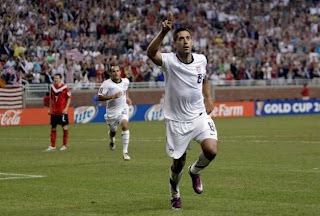 Dempsey slid in to redirect a ball into the net, putting the US up 2-0. Dempsey was active the whole night, threatening the Canuck’s goal consistently and providing a spark that’s been lacking recently for the red, white and blue. Words must be said about Tim Howard and the American back line. Not only did they preserve a shutout but they survived a Canadian onslaught late in the game. Howard came up with two crucial saves late in the half to keep the score line 2-0. The Group C matches continue this Saturday with Canada challenging Guadeloupe and USA hoping to take control versus Panama. Definitely a feel good win, after the drubbing on Saturday. I thought it was three saves, I know one may be questionable, but I'm willing to give Timmy the benefit of the doubt. Also, how about that scorpion kick that got blocked? That would have been the best goal of anything ever.